Turnberry's status as an Open venue is unlikely to be affected after Donald Trump bought the Scottish course, says R&A chief executive Peter Dawson. The American businessman has bought the iconic Ayrshire venue from the Dubai-based group Leisurecorp for an undisclosed sum. Turnberry has hosted the Open four times, most recently in 2009, when Stewart Cink won in a play-off. 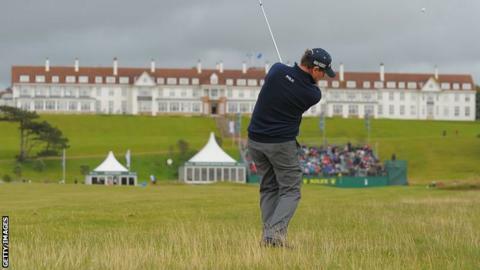 "Turnberry is a great favourite among the players and it's on the Open rota for sure," Dawson told BBC Sport. He does not envisage the South Ayrshire course's status changing with Trump as the owner "unless something happens that I can't foresee at the moment". Turnberry is the only one of the nine current Open venues that is not a private members' club. Owned by the Dubai-based Leisurecorp, it staged the "Duel in the Sun" in 1977, when Tom Watson beat Jack Nicklaus in one of the most famous Opens. Property tycoon Trump has already built the Trump International Links on the Menie Estate on the Aberdeenshire coast, and revamped Miami's Doral course, which staged the recent WGC-Cadillac Championship. Speaking at the HSBC Golf Business Forum in Abu Dhabi, Dawson said he felt the R&A would be able to handle the personality of the controversial Trump were he to become involved in staging the Open. "I don't have any difficulty with that, whatsoever," he said. "Donald Trump is investing in golf properties in Great Britain and Ireland. He must have great faith in the future of the game, which is very heartening from a businessman of his stature. "I'm quite sure if he does buy Turnberry, he will be putting a lot of investment in." Dawson was speaking publicly for the first time since announcing he will be retiring from his position with golf's governing body in September 2015. "It's purely an age thing," he said. "I will be 67 then and it will be time to go. "I will have been 16 years in the role, which coincidentally is the same length of time my three predecessors served. "We've announced it this early to get the recruitment process out in the open, to give us plenty of time to get the right individual, and enough time for the right handover period." Dawson also rejected the notion golf is struggling, despite figures showing falls in participation in traditional markets such as the UK and the United States. "I don't think it's all gloom and doom," he said. "We're seeing golf growing in so many countries in the world, much of it inspired by Olympic golf coming along." The sport returns to the Games in Rio in 2016 after a 112-year absence. "That's given golf a lot of government support in smaller golfing nations," Dawson said. "I think in more established markets we are seeing a bit of a decline. "But if golf continues to fight hard with all the development programmes we have in place, and fights hard to keep its market share as close to historical levels as possible, we will see that flatten out in developed markets. "The growth of the game will continue in smaller countries. We are, worldwide, still seeing growth in golf."